After I lost my job and was called to walk in my purpose I was extremely scared. I had a family, mortgage and bills that I needed to pay. I had no idea how I was going to make ends meet. I had a fear( a healthy fear) of not having enough. So I decide I was going to learn everything I could about prosperity, abundance and the laws around attracting money. I have to tell you that this took time but today, my business is constantly growing and I know who my Source is and where my abundance comes from. That is why I created the Money Series Podcast, sometime it’s really hard to break through limiting thoughts, but you can do it and when you do miracles occur. If you have any questions please feel free to contact me. When you begin to operate your business from a spiritual standpoint instead of a physical standpoint, you begin to see amazing things happen in your business. But if you are operating from a physical standpoint meaning you can only see what’s happening in the physical realm, you are losing lot of potential business and ways to increase your business from a metaphysical standpoint. So today I’m going to share with you five ways that you can increase your business metaphysically. Number one: You have to have a vision for your business. What do you want your business to do? How will your business serve other people? Make it clear. Write it down. There is power in the PEN. Once you are able to see your vision clearly and write it down, your vision becomes your goal. Once you write it down, you have sent the intentions to the universe and said this is what I desire for my business. Intentions serve as your agreement with the universe so it is very important to write down the vision that you see for your business. Number Two: What is your agreement with God and the universe? What will you do for what you’re asking for? As we all know, everything starts with an agreement. When you start a new job you have an agreement. It is the same spiritually. When you make an agreement with the universe you are saying this is what I want and this is what I’m willing to do. You must be ready to uphold your part of the agreement. You have to make an agreement with the universe to give back something. You cannot get something for nothing. Number Three: What will you give back in metaphysics? What is your person place or thing where you are receiving your spiritual food? Is it your church? your mentor? your life coach? It could be the waitress that helped you and told you something that uplifted your spirit. In order to receive and for your business to be prosperous, you have to give back. Rich people never worry about giving back because they know that with the law of circulation it is always returned. When we were younger we were told you can never beat God-giving. You have to give without hesitation. You will never receive more business, more money, more abundance if you’re holding on so tight to what you already have. Shift your mind. Get into a mindset of giving and giving and giving. Number Four: Listen for direction. Constantly you are being lead by the universe. The minute you ask and make it a point to be lead by Spirit, your Angels’ answers appear. Remember you create with the power of your words, so speak that which you want. Let the Angels know that you are open to guidance. Be grateful for what you already have. If you are not grateful, if if you are not thankful for what you’ve already received from God and the Universe, don’t expect to get more because you’re not going to get more. Every day you should get up and make a list of 10 things that you’re grateful for. Ten things in your business that you’re grateful for. You’re grateful for your client, you’re grateful for your computer to do your business, you’re grateful from your cell phone, you’re grateful for email, you’re grateful grateful grateful gratitude!! This opens the door to more. I would love to have your feedback so drop me a line at the bottom of this blog or, if you’re interested in learning more about how to create a flow spiritually in your business, contact me info@angelswithfran.org. What is your niche? What is that thing that you do better than anyone else? What is that thing that makes your heart sing? What is that thing that you’ve always wanted to do? That thing that you’re really really good at? My niche is the ability to hear the Angels clearly and to be a clear channel for the voice of Spirit to help people change their life and their businesses. My niche is that thing that I do with ease, that gift I have been given, my God-given gift which I have turned into my mission in life. With that niche, I have helped people launch businesses, change their businesses, get on the right career path and get on the right path in life. Did you know that if you took the time and developed your intuition, that voice that tells you this is what you should be doing, if you spend just 5 to 10 minutes today in the silence listening to directions from your intuition, you could change your life you could change your business. But you have to know how to listen. You have to learn how to distinguish the voice of Spirit from the voice of ego. That’s what I do and that’s what I teach. I teach my clients how to listen to the voice of Spirit and how to distinguish what they’re hearing from what the ego is saying. Most of the time your ego is going to give you a million reasons why you can’t do what you want to do. But the Spirit, your Angels, your intuition is always going to give you a perfect road map. The minute that you embrace that power and use it in your life your life will change. Here are three steps to begin to listen, connect and trust your intuition. Number One: Take five minutes a day to sit and be grateful. Make a list of five things that you are thankful for first thing in the morning. I use my Angels are my Superpower journal, because it reminds me that my Angels are always with me and it’s small enough to carry in my purse. Number Two: Write down your dreams for that day. What is it that you want your life to look like just that day? What would you like to have happen that would just make you fantastically happy? What do you want in that day? What are your intentions? Number Three: Close your eyes and open your hands and sit in complete silence for three minutes. If you have to set the timer, set the timer for three minutes. Just sit in the silence. When your three minutes are up, give thanks for that time. Grab your pen and write down whatever you were feeling. Don’t think about it, just whatever comes to you write that down. That will be your inner guidance system, your GPS, your intuition. When you look over your notes, you’ll realize that there is absolutely no way that you would know the things that you have been given. It’s not your ego, it’s actually your Angels. I’m going to encourage you to try this for the next seven days and then tell watch what happens. Many people that I talk to feel like you have to struggle, be poor, or have very little in order to be in line for the blessings of God. The most recent conversation I had was one when I walked into an event with a designer bag, not thinking anything about it. After I spoke and went out to greet the audience one of the ladies said to me ” Do you think that God is ok with you having that bag?” At first I didn’t know what to say. I am sure that my face was in a state of shock, but I quietly excused myself from the other guests and we stepped aside and I explained to her what I feel everyone should know. A conceptual look at prosperity with associated words, blue toned. 1)God does not want you to be poor. (Deut 8v 18) I hear it all the time that the less you have the closer you are to the heart of God and I am here to tell you that is not true. The law of giving and receiving states that what you give you shall receive. If you have nothing to give how can you expect to receive anything. God did not create you to suffer. God wants you to help yourself and help others and it’s hard to do that if you believe you should be broke. 3) I am a big believer in tithing. (Malachi 3v10) I tithe 10-15% of all monies I receive from all sources, gifts, presents, business, any monies that come into my hands I give back to the place where I receive my spiritual food. I can tell you that when I don’t tithe my income slows down. For many years I had a hard time giving my 10%. I just couldn’t imagine God wanting me to give money that I didn’t have to someone who had way more than me. But once I understood the principals of the Law of Circulation and saw it in action, I wanted to give more and more. 4) God has given us the ability to choose. We have free will and we create our life with our spoken word. Whatever you desire in your life with faith and belief is possible. (Proverbs 23v7, Hebrew 11v1 Proverbs 21v5). So this is what I know for sure: With God all things are possible. I love my life and with prayer, intentions, and faith I have seen miraculous things happen. So don’t be afraid to have more, don’t allow the guilt of what someone else feels keep you locked in the same spot. You have a right to have, do, and be as fabulous as you want. Your life should be an example of what God can do for you if you trust him, if thats a designer bag so be it. Your relationship with God is a personal one. Don’t allow anyone to come between that. Today as I was talking to my mastermind group about the Laws of Prosperity which causes the Divine flow of the universe. Do you know that most people don’t know that there are laws that govern prosperity? Most people think they should work hard and live on a little. I am here to tell you that is just NOT true. You were not created to struggle. You were not sent here to live in lack. You are created to live an abundantly prosperous life in ALL areas: money, health, love, and business. Whatever you want you can have if you follow the Laws of the Universe. Everything on the planet is govern by law and prosperity is no different. I am going to share 3 of the most important laws with you, If you practice these daily you will start to see a shift in your life. Law 1:Thoughts are things and words have power: Every single thing that you think and say you attract. If your thoughts and words are good you are drawing good things to you. We are all beings of energy and the vibration that you send out to the world is like a magnet attracting to you what you are sending out. Law 2: If you can see it you can be it, Simple. 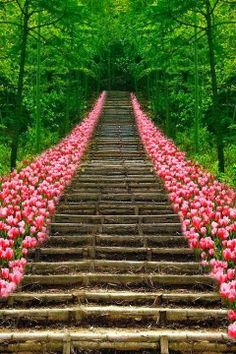 If you can close your eyes and visualize yourself in the position, the place and time in your life that you imagine for yourself, you are half way there. You must be able to actually see what your life would be like if you have what you desire. What does it look like? How do you feel? Where do you live? What if you had all the prosperity you want, what would life look like? Law 3: Be Thankful. It doesn’t matter how big or small, give thanks. Let the universe know that you appreciate what you have. Start a gratitude list, write down 5 things daily that you are thankful for. Be thankful for your health, your friends, and your family. Enter into his gates with thanksgiving and into his courts with praise: be thankful unto him, and bless his name. Psalm 100 v 4 Giving thanks opens the door for great things. If you are truly ready to live the life that you’ve always dreamed of you must change your mindset and that is the first law. Well we’re here! 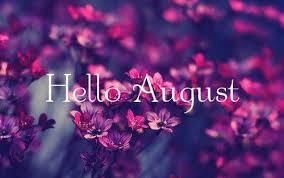 Hello August ! I am so excited about this month, let me tell you why. We are in a 8 year per numerology. Number 8 resonates with the influences and vibrations of authority and personal power, self-confidence, spiritual confidence, inner-strength, and material freedom, success, good judgement, money, finances, riches, manifesting wealth, abundance and prosperity, provision, investments, discrimination and discernment, giving and receiving, thoroughness. As you know the number 8 represent infinite blesssings in every area of your life. The number 8 is never ending as is this marvelous universe that we live it. Now we are in the 8 month which is double infinity!!! Mystic say that the number 8 carries the vibration of plenty, plenty, plenty and my Angels tell me this month is going to be powerful!! 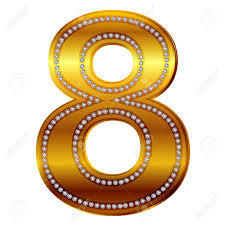 If you are looking for an increase in your life incorporate the 8’s in your life. * Place the number 8 around our home over doorways ie your front and back entrance. The entryway to your home office if you have one. * Place the number eight in your wallet where you carry your money. *Put the number 8 on your computer where you work and pay your bills.